Mobile's Mitchell Cancer Institute was beautifully lit in teal to observe A State of Teal in 2015. Other properties across the state also participated. Click to view areas around the state lit in teal. 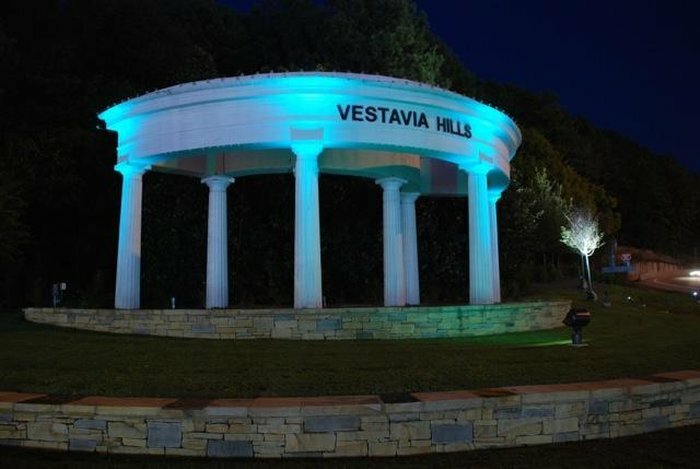 The Vestavia Dogwood Arch was lit in teal to observe A State of Teal in 2015. The City of Hoover once again participated in A State of Teal in 2015. Click for some photos of municipal buildings. The City of Pelham and other Pelham businesses were a part of A State of Teal. The City displayed magnets on their official vehicles and also applying lighting to City Hall. Click for more photos. Gardendale participated in A State of Teal by not only lighting properties but also applying teal cloth to the lamp posts at the Civic Center, teal dye in the fountain and also purchasing and displaying ASOT magnets on their official vehicles. Click to see more. The Crescent Building on the southside of Birmingham was one of many properties lit up in teal. Click to view other photos in this album. Thanks to survivor Sondra Epperson and her team for their hard work in turning Sylacauga teal to raise awareness to Ovarian/GYN Cancer symptoms.